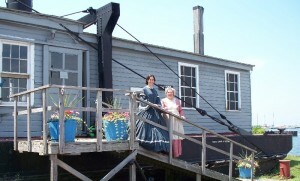 OSWEGO, NY – On July 31, the H. Lee White Marine Museum and the Oswego Maritime Foundation are hosting a celebration of the New York State Canal System and the birthday of George Goble, well known local shipbuilder during the 1800s to early 1900s. Derrick Boat No. 8 was the last steam powered vessel left on the barge canal. She served long and honorably as a work boat engaged for 50 years in canal maintenance. The boat is the centerpiece of the Historic Maritime District's Annual Canal Celebration, which this year, honors the birthday of legendary Oswego shipbuilder George Gobel. Goble was born in 1819 on Aug. 2 and lived a long life into his 80s. “The Oswego Canal played an important role in transporting products and people between the canal, the Great Lakes and beyond. The museum’s Derrick Boat 8 served on the canal for over 60 years and is a piece of history that helps tell the story,” noted Mercedes Niess, executive director of the museum. Goble was first employed as a ship carpenter with Sylvester Doolittle, but after a short time began to do shipbuilding for himself and finally established his own shipyard and dry-dock business. Goble’s first building yards were located at the foot of West Fourth Street. He then relocated to the waterfront off Lake Street, which is now theÂ home of the Oswego Maritime Foundation where his original dry dock can be seen today. 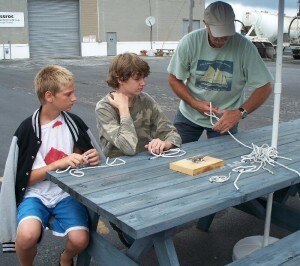 Youth enjoy activities at a past Canal Celebration at Oswego's Historic Maritime District. The event will again be held on July 31, from 1-4 p.m. The Goble Shipyard built 35 different boats – including yachts, schooners, tugs and other craft. The festivities will begin at 1 p.m. with a short program, party games, music, storytelling, refreshments and birthday cake. The Marine Museum will be open all day free of charge. For more information, call 342-0480. Check the museum website for further family programming, scheduled throughout the rest of the year!